Set Python Environment Variable in Windows. Some times after installing Python, you may face issue like. Solve the issue by fallowing below step by step procedure on the windows. 1 ) Right click on My Computer open the option Properties.then you will find advanced system settings option then click on it. 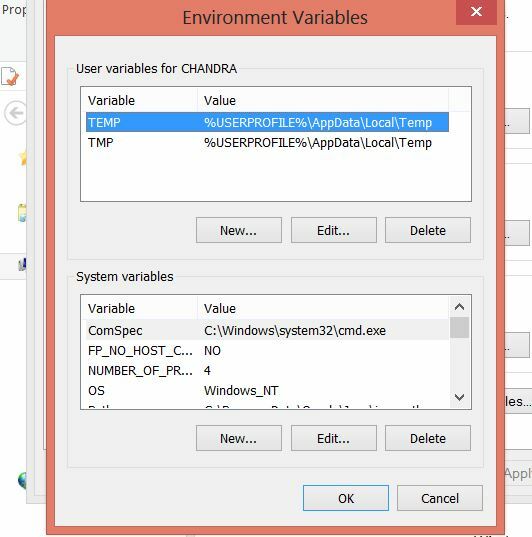 2) After clicking advanced setting link will find new tab with Environment variables tab click on it. 3) Copy the Python installation path, default path would be (C:\Python27).Then click the edit button of user variable settings and paste the path here.and repeat same for system variable also. 4) Then put the OK and come out from screens open fresh command prompt then try python installation. This is not for all the cases i.e ideally path should be set automatically . some times due to our system settings it wan’t happen then without any doubts apply the above steps and come out form the issue and do actual work .